Why does animal abuse seem to elicit more outrage than child abuse? 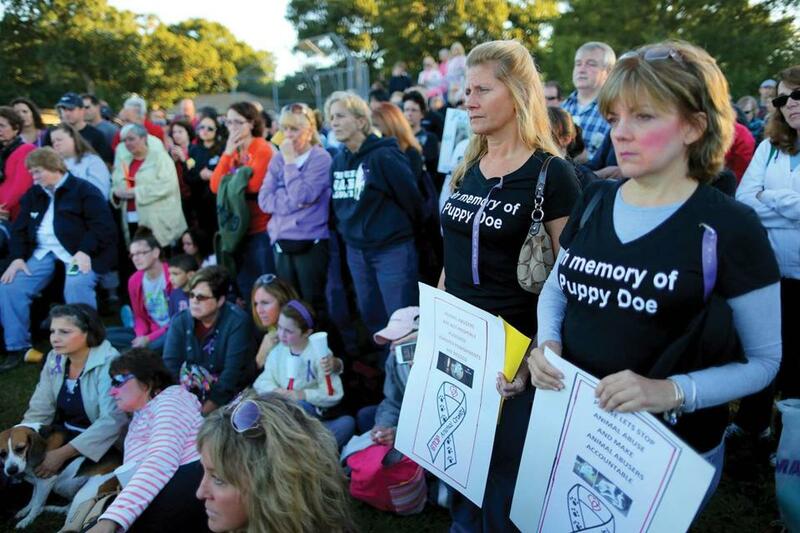 A late September vigil for Puppy Doe in Quincy. “I think you are almost as scary as the monster who brutally tortured and murdered Puppy Doe Kiya. You are a very sad and pathetic man.” Then there was this: “You should be silenced, period!” These were two of the more thoughtful communiques I received in response to a December TV commentary I did on the day the alleged abuser of Puppy Doe, the pit bull ultimately put down because of her injuries, was arraigned. Here’s what I said that apparently offended most: “While the crimes of the alleged torturer of Puppy Doe are horrific, I am constantly struck by the contrast between the reaction to this man and to people who do the same thing to humans, especially young humans.” I then mentioned Jeremiah Oliver, the 5-year-old Fitchburg boy ignored by the state’s Department of Children and Families, missing for months, allegedly endangered by his mother and abused by her boyfriend, and now feared dead. My point was not that we should ignore animal cruelty, but often it seems that concern for the protection of nonhuman animals trumps empathy for the human variety. There were several vigils for both victims, but they differed greatly in size. One in Quincy for the abused dog in late September drew an estimated crowd of 700 people. Maybe three dozen attended a vigil in Fitchburg for Jeremiah in mid-December. A Facebook page for the little boy had nearly 600 “likes” in late-January. One seeking justice for the badly battered pit bull had more than 81,000. But anecdotes are just that, conclusive proof of not much. So in an attempt to be fairer than I might ordinarily be, I’ve since sought out people with expertise in the area (a friend of mine suggested that all of my sources be pet owners, too). Are there times when some put animals higher in their pantheon of concerns than they do people? “Never,” answers Vicki Croke (owner of an Irish wolfhound), author of the Globe’s “Animal Beat” for more than a decade and now a co-producer of The Animalist blog at wbur.org. “In a high percentage of domestic violence cases, a pet was a prior victim,” Croke says. But in all the interviews I saw, rarely was that cited as a motivation by Puppy Doe justice-seekers. I then went looking for more hard data — and I found some in the research of Jack Levin (owns a Coton de Tulear, which he says looks like him) and his Northeastern University colleague, Arnie Arluke (three cats). They presented a paper last August to the American Sociological Association. Of the 240 18-to-25-year-olds sampled, more showed concern for the welfare of a dog than that of a human, but only if the person was an adult. Levin told me that when someone of a more tender age was substituted: “It’s fair to say a young child and a dog get the same amount of sympathy.” The same amount! Levin believes it’s explained by the vulnerability or innocence of the victim, which makes sense. He further suggested that we anthropomorphize our pets, considering them part of our family. True enough, but Puppy Doe wasn’t the pet of the masses of people who rallied for her. My last stop was with a woman who has built a career prosecuting abusers of kids. Attorney General Martha Coakley (two Labs, Jefferson and Jackson, at home) sent me a statement acknowledging some imbalance in response: “I believe one difference in the public’s reaction is that people are able to see images of abused animals. If the public saw the deeply disturbing images that I have seen prosecuting cases of child abuse, they would be even more outraged.” Coakley doesn’t advocate the display of such photos, but she has a point — to a point. Do we really need a picture to respond adequately to human suffering? And without a photo of a kid covered in bruises, do we lose our moral compass? So here’s where I end up: right where I started. Animal abuse is sadistic, indefensible. Human abuse is even worse. To condemn the latter is not to tolerate the former. But far too many humans just don’t get it. Some advocates argue that certain animals should have the same legal rights and protections as people. The Animalist’s Croke tried to reassure me: “We have a long, long way to go before we have to worry about our dog suing us.” I’m worried now, Vicki. Maybe animals won’t name us as defendants, but humans are doing it for them. In December, a New York State court rejected a case seeking personhood for chimpanzees. Can’t we protect apes and dogs without pretending they are us? The next test for my unpopular thesis is Tuesday, when the next hearing for the alleged abuser of Puppy Doe is scheduled for court. It’s a safe bet there will be a phalanx of protesters inside and outside the courtroom. That’s good. If some of them go to the hearing when the alleged abuser, maybe killer, of Jeremiah Oliver next stands before a judge, I’ll admit I was wrong. Jim Braude is host of Broadside: The News With Jim Braude on NECN and co-host of WGBH’s Boston Public Radio on 89.7 FM. You can follow him on Twitter @jimbraude. Send comments to magazine@globe.com.